Shelby Miller struck out 19 and had an 0.75 ERA over 12 innings in two rehab starts for Visalia. 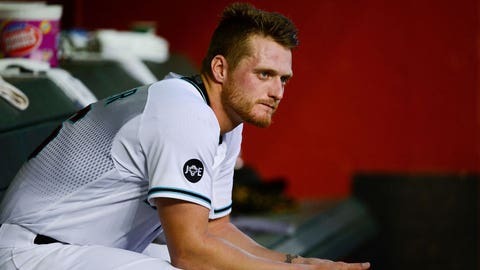 PHOENIX — Shelby Miller pitched struck out eight over six innings on Tuesday night in his second rehab start with Advanced-A Visalia and is on track to rejoin the Diamondbacks rotation this weekend in Philadelphia. Miller threw 100 pitches — 69 strikes — and gave up six hits, one walk and three runs, though only one was unearned, in an 8-3 victory over Bakersfield. Bakersfield scored twice in the second inning after the first two batters reached on fielding errors and came around to score with two out. The third run came on a pair of hits in the sixth. D-backs manager Chip Hale said that as long as Miller emerges from the start in good health, he’s likely to start Sunday or Monday against the Phillies. "Everything was good," D Hale said. "Three or four misplays in the second inning that caused his pitch count to go way up, but he pitched through it and probably could have pitched eight innings. Everything’s on board for him to start up here next time." Miller has struck out 19 and given up one earned run over 12 innings in his two rehab starts. Miller would replace Zack Godley in the rotation. Hale said Godley could stick with the team in a bullpen role once Miller is activated. "We’re going to figure that out, whether we keep him there or have him go back and start," he said. The D-backs recalled left-handed reliever Andrew Chafin from Triple-A Reno and optioned lefty Zac Curtis to Double-A Mobile. Chafin worked 7 2/3 scoreless innings for Reno. He began the season with the D-backs and had an 0-1 record and 9.00 ERA in 23 appearances. Curtis, who began the season at Visalia,was 0-0 with a 5.23 ERA in 10 1/3 innings. He gave up his first home run Tuesday night to Chase Utley. "We felt like it was time for Zac to go back down and get some more work and get his breaking ball tightened up," Hale said. "Consistent work is hard to get for one left-handed reliever I told him I felt bad, because it was almost like we warmed him up every game and hardly got him in. "It’s a completely new role for him. He handled everything really well. He just has to get his breaking ball back to where it was and he’ll be back here."